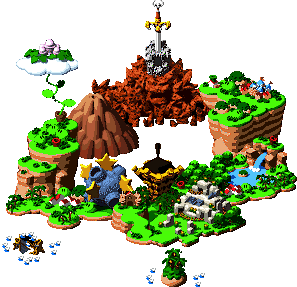 Bean Valley is a large area that leads to Nimbus Land found in the game Super Mario RPG: Legend of the Seven Stars. There are two major parts to Bean Valley. The first is on the ground, and the area is characterized by its fall-like orange vegetation. Many Warp Pipes are located in the area, one of which eventually leads to Grate Guy's Casino, a hidden area. 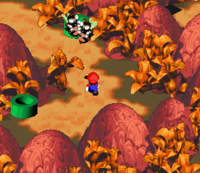 Near the end of the part of Bean Valley on the ground, Mario fights Megasmilax, a large Piranha Plant subspecies. After defeating Megasmilax, a new path becomes accessible. It leads to a small area with a floating brick block in the air. By hitting it, a beanstalk grows. This beanstalk leads to the clouds and second half of Bean Valley. The beanstalks in this area are more common. 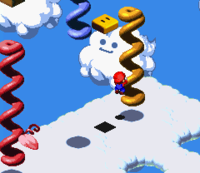 There is no ground, but Mario is able to walk on the clouds. Beanstalks scatter the area, but they do not grow out of the clouds; they float slightly above them, and many must be climbed on the way to the top. They come in a variety of colors. After several beanstalks, Bean Valley ends with the entrance to Nimbus Land. This page was last edited on February 22, 2019, at 14:31.